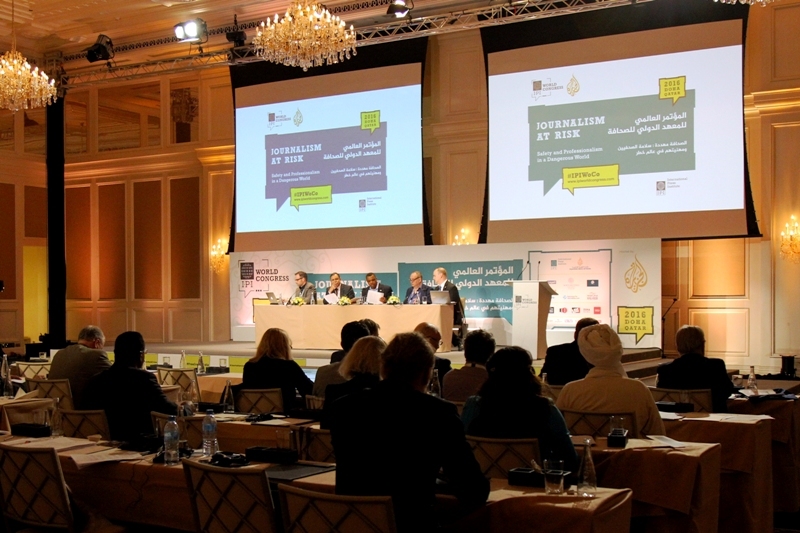 Countries across the Middle East must do more to respect press freedom and free expression in both law and practice, leading international journalists gathered in Qatar for the International Press Institute (IPI)’s World Congress said today. IPI members, meeting at their 65th Annual General Assembly in Doha, unanimously adopted four resolutions urging governments in the region to free journalists and others imprisoned for exercising those rights, and to uphold their commitments to respect all fundamental human rights. In the first resolution, IPI members called on member states of the Gulf Cooperation Council (GCC) to end abuses of public order and state security laws to punish critical journalism. They also called on the GCC, which includes Qatar, to abolish criminal defamation and blasphemy laws, as well as similar provisions granting special protection to reputations of the state or heads of state, and to respect peoples’ right to share and access information online. The resolution noted that at least five journalists or bloggers are currently being held in Bahrain and seven are being held in Saudi Arabia, including the blogger Raif Badawi, who faces a sentence of 10 years in prison, 1,000 lashes and a fine for allegedly “insulting Islam through electronic channels”. A second resolution urged Iran to free dozens of bloggers and journalists currently behind bars and to capitalise on recent political developments to move to ensure that journalists are allowed to cover news in the public interest without fear of violence or arbitrary detention. In the third resolution, IPI members called on Turkey to end an escalating crackdown on independent media and dissenting voices that has seen the misuse of anti-terrorism laws to target and imprison journalists reporting on public interest issues, as well as the abuse of criminal defamation laws to silence any criticism of President Recep Tayyip Erdoğan and his policies. The fourth resolution similarly urged Egypt to free imprisoned journalists, many of whom have been mistreated, and to uphold free expression provisions enshrined in the country’s 2014 Constitution, which was approved by 98 percent of those voting on its adoption. IPI members also stressed the need to end abuse of overly broad anti-terrorism laws and reform the country’s judiciary to ensure independence. IPI members today also unanimously approved a fifth resolution calling on member states of the Organization for Security and Co-operation in Europe (OSCE) to fully support the Office of the OSCE Representative on Freedom of the Media. The current Representative, Dunja Mijatović, was recently reappointed to a one-year term amid rumours of political wrangling over who was to be named her successor following the conclusion of her previous term on March 10. That decision, which requires unanimous approval by all 57 participating OSCE member states, has now been put off until 2017. The full text of each of the five resolutions appears below. In other news, IPI members today elected five new members to IPI’s Executive Board, which holds supervisory authority over IPI. The new members include Beata Balogová, editor-in-chief of the Slovak daily newspaper SME; Woosuk Kenneth Choi, deputy editor of the daily Chosun Ilbo in South Korea; Kadri Gürsel, journalist and political columnist for the Al-Monitor and Diken news websites and chair of IPI’s Turkey National Committee; Joe Muganda, group CEO of the Nation Media Group in Kenya; and Virginia Pérez Alonso, deputy editor-in-chief of the Spanish newspaper El Mundo. Pursuant to constitutional changes that IPI members also approved today, the new IPI Executive Board members were elected to three-year terms, with a limit of no more than two consecutive terms. Former Executive Board members who served two terms may stand for election to rejoin the Board after having been out of office for three years. The members of the International Press Institute (IPI), meeting at their 65th Annual General Assembly during the IPI World Congress on March 21, 2016 in Doha, Qatar, adopted by unanimous vote a resolution calling on the countries of the Gulf Cooperation Council (GCC) to respect the fundamental human rights of free expression and media freedom in both law and practice. All GCC countries except for Saudi Arabia guarantee freedom of expression in their constitutions. Unfortunately, these guarantees remain the equivalent of an unfulfilled promise. While incremental liberalisation can be occasionally seen in some GCC countries and while the region is home to a number of vibrant news outlets, local journalism continues to operate under official censorship as well as heavy self-censoring pressures. Journalists who publish stories that cross certain red lines, especially in relation to government or religious matters, are subject to intimidation, harassment, arrest, imprisonment and, in some cases, torture. IPI members called upon GCC authorities to immediately release all individuals held for exercising their right to freedom of expression. At least five journalists or bloggers are currently being held in Bahrain and seven in Saudi Arabia, including the blogger Raif Badawi. Members specifically called on World Congress host Qatar to free the poet Mohammed Al-Ajami. IPI members urged GCC countries to end the cynical abuse of public order and state security laws to punish critical journalism. They also called for the abolition of all criminal defamation laws and blasphemy laws, as well as any criminal provisions protecting the reputations of the state or heads of state. Such provisions do not comply with international standards on freedom of expression and continue to be exploited to silence legitimate public debate. Finally, IPI members expressed alarm over growing threats to online freedom of expression in the GCC region, including through content filtering, restrictive cybercrime laws and onerous website registration requirements. IPI Members accordingly called on GCC governments to respect their citizens’ right to share and access information through the Internet. IPI members further noted that they remain open to engage in dialogue with the governments of GCC member states should they indicate a serious desire to make improvements in the free expression and press freedom situations in their countries. The members of the International Press Institute (IPI), meeting at their 65th Annual General Assembly during the IPI World Congress on March 21, 2016 in Doha, Qatar, adopted by unanimous vote a resolution welcoming recent political developments in Iran, but urging the country to free imprisoned journalists and ensure greater respect for human rights and free expression. Journalism is an extremely hazardous profession in the Islamic Republic of Iran. The country is regularly a world leader in the number of journalists behind bars and those who criticise the state or officials face systematic persecution, including intimidation, arrest, imprisonment, torture and even death. Moreover, impunity for officials who commit abuses remains pervasive. Repression against journalists has been common during the course of Iran’s recent history, leading IPI to name four journalists from Iran – Ahmad Zeidabadi, Mashallah Shamsolvaezin, Akbar Ganji and Faraj Sarkohi, all of whom spent time behind bars for engaging in journalism – as World Press Freedom Heroes. However, that repression became particularly acute following the disputed presidential election in 2009. According to the campaign journalismisnotacrime.com, some 43 journalists, bloggers and citizen journalists are currently imprisoned in Iran as a result of their work. Numerous others regularly engage in self-censorship and avoid discussion of sensitive topics. Nevertheless, Iran has recently seen some potentially positive political developments. Self-identified pro-reform candidates made strong gains in parliamentary elections and two of the most radical clerics were ousted from the Assembly of Experts, a panel with the constitutional duty to select the nation’s next supreme leader when that position becomes vacant. IPI members welcomed these developments, insofar as they could lead to greater respect for human rights, and the members urged Iranian lawmakers to end the country’s persecution of journalists and to enact reforms to ensure the country brings itself fully into line with international standards on free expression and media freedom. As a first step, IPI members called on Iran’s government to release all journalists, bloggers and citizen journalists currently behind bars because of their work. IPI members also urged the government to ensure that journalists are allowed to cover news in the public interest without fear of violence or arbitrary detention, and they called on the government to ensure that anyone responsible for violence, harassment or intimidation directed toward journalists is held accountable. IPI members further noted that they remain open to engage in dialogue with Iran’s government should it indicate a serious desire to make improvements in the free expression and press freedom situation in Iran. The members of the International Press Institute (IPI), meeting at their 65th Annual General Assembly during the IPI World Congress on March 21, 2016 in Doha, Qatar, adopted by unanimous vote a resolution calling on Turkish authorities to respect guarantees of press freedom and free expression, and to end an escalating crackdown on independent media and dissenting voices. Turkey’s Constitution explicitly recognises the rights of press freedom and free expression. Turkey is also a signatory to the European Convention on Human Rights, which similarly recognises those rights. However, in practice, respect for both rights has steadily eroded over the past decade as Justice and Development Party (AKP) leaders have systematically used the power of the state to establish dominance over the media landscape and to silence their critics. That misuse of state power has been dramatically illustrated in recent months by two developments, which are by no means isolated: the imprisonment and impending trial of two Cumhuriyet editors on terrorism and espionage charges in retaliation for their reports on allegations that Turkey’s intelligence agency was arming Islamist rebels in Syria, and the state’s seizure of opposition media outlets, including the March 2016 takeover of the Zaman media group and the Cihan News Agency. IPI members called on authorities in Turkey to obey their oaths to uphold the country’s Constitution and to respect decisions by Turkey’s Constitutional Court upholding human rights, including the recent decision freeing the Cumhuriyet editors. 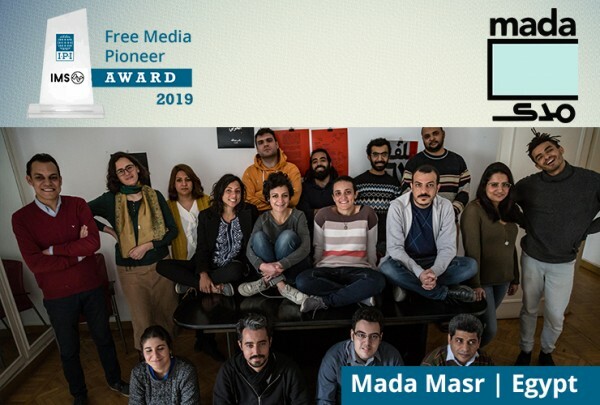 They similarly called on authorities to immediately dismiss the criminal case against those editors and all other journalists targeted as a result of their work, and to free all journalists currently imprisoned for engaging in journalism. IPI members further called for an end to authorities’ abuse of legal provisions to punish dissent and persecute government critics, particularly the misuse of anti-terrorism and insult/defamation laws, and for authorities to refrain from applying pressure against journalists to influence news coverage. IPI members finally urged Turkey and its people not to approve any proposed changes to the country’s Constitution that would contravene Turkey’s commitments to uphold press freedom and free expression, or that would in any way abridge citizens’ right to receive the information they need to make informed decisions at the ballot box and ensure accountability by their leaders. 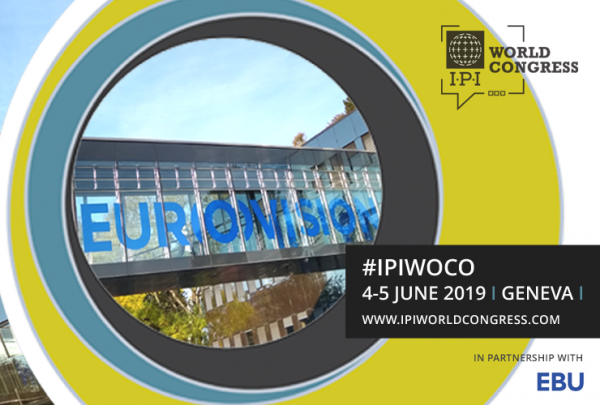 IPI members further noted that they remain open to engage in dialogue with Turkey’s government should it indicate a serious desire to make improvements in the free expression and press freedom situation in Turkey. The members of the International Press Institute (IPI), meeting at their 65th Annual General Assembly during the IPI World Congress on March 21, 2016 in Doha, Qatar, adopted by unanimous vote a resolution calling on Egypt to free imprisoned journalists and to respect constitutional guarantees of free expression and press freedom. In a January 2014 referendum, 98 percent of Egyptian voters approved a new Constitution following the 2013 coup d’état that ousted former President Mohamed Morsi and brought current President Abdel Fattah al-Sisi to power. Art. 65 of Egypt’s Constitution states: “Freedom of thought and opinion is guaranteed. Every person shall have the right to express his/her opinion verbally, in writing, through imagery, or by any other means of expression and publication.” Art. 70 guarantees press freedom in similarly strong terms. Despite these guarantees, journalists reporting in Egypt continue to face severe government repression, including the threat of arbitrary arrest and detention. Dozens are currently behind bars due to their work, with many held under the country’s overly broad anti-terrorism laws, which are being used to silence reporting that challenges official versions of events. Numerous others have been convicted and sentenced in absentia. Journalists detained in Egypt also face systematic deprivation of their rights, including the right to due process. There have been limited positive steps in recent months. In September 2015, following a sustained international campaign, President al-Sisi pardoned three Al Jazeera journalists who had been sentenced to three years in prison on spurious charges of spreading false news and damaging national security. In December, the Court of Cassation ordered a retrial in the “Rabaa Operations Room” case, which saw one journalist sentenced to death and 13 others to life in prison. While welcoming these moves, IPI members expressed deep concern over continued, flagrant violations of press freedom in Egypt, in particular the imprisonment of journalists and, in some cases, severe mistreatment of those held. IPI members called on Egypt to fully uphold the country’s constitutional guarantees for press freedom and free expression that were overwhelmingly supported by Egypt’s voters. As an immediate step, they called on Egypt to immediately free all journalists imprisoned in the country for their work. IPI members urged Egyptian authorities to ensure that journalists can independently cover issues of public concern without fear of arbitrary detention and to reform overly broad anti-terrorism and other laws that stifle journalists’ ability to report. They also called for Egypt to ensure that the country’s judges are free to – and, in fact, do – act independent of political pressure and that the legal process protects individuals’ basic rights to enjoy due process. IPI members further noted that they remain open to engage in dialogue with Egypt’s government should it indicate a serious desire to make improvements in the free expression and press freedom situation in Egypt. IPI General Assembly resolution calling on OSCE member states to fully support the OSCE Office of the Representative on Freedom of the Media. The members of the International Press Institute (IPI), meeting at their 65th Annual General Assembly during the IPI World Congress on March 21, 2016 in Doha, Qatar, adopted by unanimous vote a resolution calling on member states of the Organization for Security and Co-operation in Europe (OSCE) to fully support the Office of the OSCE Representative on Freedom of the Media. The position of OSCE Media Freedom Representative was established in 1997 with a mandate to strengthen the observance of freedom of expression and media freedom in participating OSCE states. IPI was one of a handful of non-governmental media freedom organisations that participated in the 1997 dialogue that led to the post’s creation. The Representative is the world’s only inter-governmental media freedom watchdog specifically devoted to upholding media freedom. The dedicated and institutionalized nature of the Representative’s role in monitoring relevant media developments in the OSCE region and in assisting participating states in implementing their media freedom commitments, including ensuring journalists’ safety, creates a powerful structure to effect meaningful change. As such, the Office of the OSCE Representative on Freedom of the Media has played an invaluable role, one that IPI members hope it will continue to perform. IPI members welcomed the recent decision to extend the appointment of the current Representative, Dunja Mijatović, for an additional year. Mijatović’s work engaging with OSCE member states on their media freedom commitments and speaking out forcefully about threats to media freedom has advanced the mission of the Office and is already certain to leave behind a strong legacy. IPI members also called on all OSCE member states to work together at the close of Mijatović’s new term to achieve consensus on a nominee who will be committed to robustly fulfilling the post’s mandate and to swiftly approve that nominee.